Ursuline High School is proud to present the 2019 Summer Camp Series. 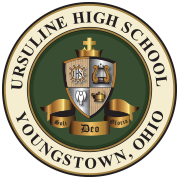 Students in grades kindergarten – eighth grade will have the opportunity for summer enrichment with the Ursuline Irish. Please register using your child’s grade for the 2019-2020 school year. Experience Ursuline’s first-rate programs and facilities with the various summer opportunities. Please visit the registration site to secure your spot today! The 2019 Summer Camp Series includes – Art Camp, Boys’ Basketball, Boys’ & Girls’ Soccer, Boys’ & Girls’ Tennis, Broadway Kids (theatre), Cheerleading, Football, Girls’ Basketball, Speech and Debate, and Volleyball. Please contact Ursuline High School at 330-744-4563 with any questions.